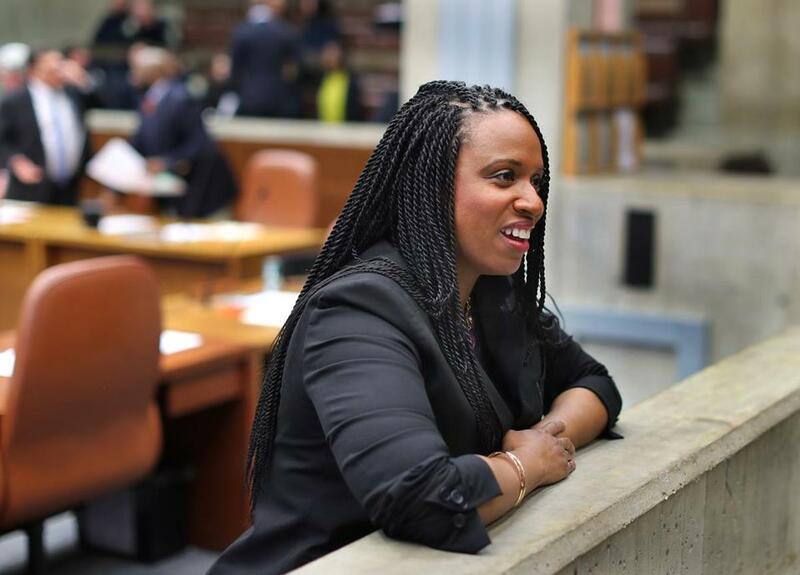 At-Large City Councilor Ayanna Pressley is fresh off a strong finish in her reelection last November. At-Large City Councilor Ayanna Pressley, fresh off a strong finish in her reelection last November, is getting more serious about potentially challenging US Representative Michael Capuano. She’s sitting down to meet with some major political players, including a face-to-face with the congressman. After several weeks of behind-the-scenes testing the waters and polling, Pressley, the first woman of color to serve on the council, huddled Tuesday with former governor Deval Patrick, the state’s first African-American governor, to brief him on her potential bid, according to someone with knowledge of the meeting. That was just after she sat down with Capuano, telling him she will be making up her mind in the next couple of weeks whether she will challenge the 66-year-old Somerville Democrat in the September primary, when he runs for an 11th term. Pressley told Capuano, who can practice a tough game of politics, that she would conduct an “aspirational” campaign if she runs, according to a source briefed on the meeting. “She’sdefinitely on the move, and we’re getting ready,’’ said the source, who supports Capuano. Pressley did not return calls made to her City Hall office. Indeed, her maneuvering has prompted Capuano, who has not faced a serious challenge since his 1998 election to Congress, to take the potential challenge seriously. His aides said they are well aware that with the current turmoil in American politics and volatility among the electorate, any veteran incumbent, no matter their record and poll numbers, has to run scared in the post-Trump electoral climate. Capuano’s political folks say they are putting in place a serious campaign team — something he hasn’t had to do in 20 years. He has signed up veteran Democratic pollster Tom Kiley, is getting a media consultant lined up, is on the verge of hiring a campaign manager, and is ratcheting up his fund-raising. He also has close to $800,000 in his campaign account — and, as an incumbent, access to much more. By most indications, Pressley, an eight-year incumbent on the council who has twice topped the citywide ticket, has the experience to give the congressman a run for his money. But it would be an uphill fight. Capuano has deep political roots that Pressley would have to overcome. For example, while she sought out Patrick, the former governor owes a lot to Capuano for his having been the first heavy-weight Democrat to endorse his 2006 insurgent gubernatorial campaign. What’s more, Mayor Martin J. Walsh might not want her to run. His office said he was not available to comment, but his political sway over Pressley could be considerable. Her husband, Conan Harris, works for Walsh as his deputy director of the mayor’s Office of Public Safety Initiatives, making about $85,000 a year. And this primary would hardly be a battle over ideology. Pressley can’t challenge Capuano from the left: He has top ratings among all the liberal interest groups that dominate state Democratic primaries. And the Seventh District is one of the most liberal in the country. Still, Capuano’s grip on the district is not the same as when he was first elected to Congress, thanks to redistricting in 2011 that made it a majority-minority seat. His district used to be dominated by the Somerville/Cambridge axis of progressive Democrats, along with minority wards in Boston.